Origin and Habitat: Near Bethanien, Namibia. Description: Lithops schwantesii var. urikosensis is a distinct variety of the variable Lithops schwantesii. It distinguishes for the upper surface very rugose, slightly grey-white with about 18–23 dark blood-red dots and lines. It has the same variable characteristics of the species. Habit: It is a tiny caespitose succulent that grows almost completely buried in the soil with only the upper truncated portion of leaves visible. Bodies usually forming groups with 4-6 heads, but occasionally forming small mounds with up to 15 or more heads, up to 4 cm high. 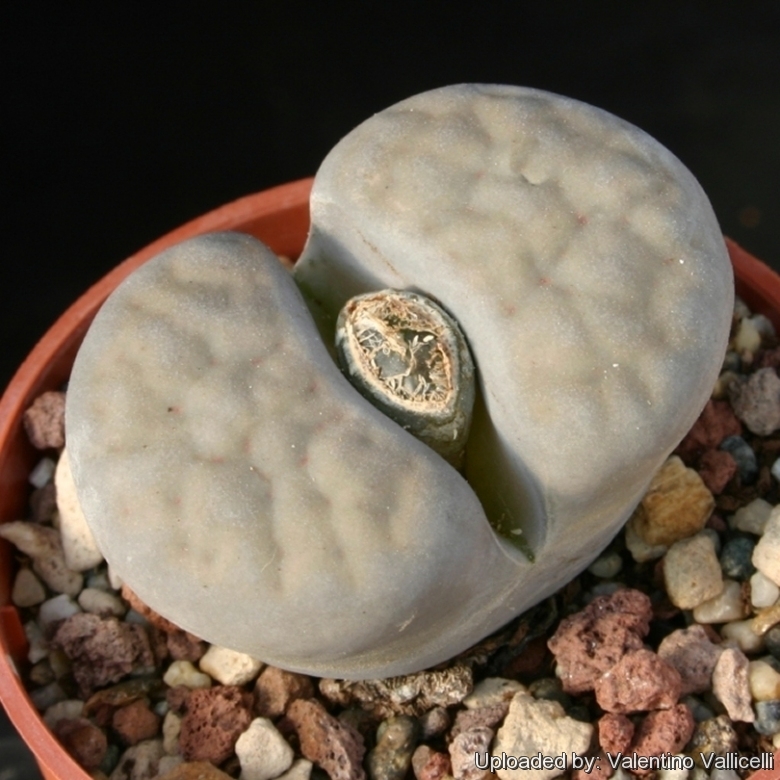 It is variable, but conforms to the typical Lithops morphology: two thick, fleshy windowed leaves separated by a crack from which a yellow flower appears [G.C. Nel 1946]. The windowed part allows light into the inner portion of the leaf where the process of photosynthesis is carried out. Old leaves persist for one year usually, often for two years. Bodies (paired leaves): Truncate in profile, 20-40 mm long, 15-30 mm broad, window opaque; top of lobe rugose, the top surface of the wrinkles coloured pale yellowish-grey, in the depressions dark-brown dots, a few sometimes interconnected forming short lines of the same colour; dots and lines with a distinct dark mauve-grey border; in the older stage top of wrinkles assumes a more pronounced yellowish tint; the dots disappear and only darker coloured dendritic lines prominent. Flower: Yellow, often with longish pedicels, 20-36 mm in diameter. Fruit: 5(-6) chambered, profile boat-shaped, top more or less flat, faces elliptic to broadly elliptic. Lithops gulielmi L. Bolus: top surface tight grey-white with many prominent blood-red dots or lines in the depressions, the dots forming the prominent feature, lines and dots isolated and not connected; window opaque. Dostribution: Klein Karasberge. Lithops schwantesii C076 70 km W of Maltahöhe, Namibia: pinkish grey, mottled red lines. Lithops schwantesii C077 Near Helmeringhausen, Namibia: orange grey, pink tinge. Lithops schwantesii C079 25 km SW of Helmeringhausen, Namibia: orange grey, stonelike. Lithops schwantesii C080 30 km SW of Helmeringhausen, Namibia: rusty pink, brilliant. Lithops schwantesii C106 80 km W of Maltahöhe, Namibia: transparent dots and lines. Lithops schwantesii C143B 60 km NNE of Aus, Namibia: mustardy, with red streaks. Lithops schwantesii C144 (grey Form) 55 km NNE of Aus, Namibia: pinkish grey body, red lines. Lithops schwantesii C145 55 km NE of Aus, Namibia: reddish grey, clear dots. Lithops schwantesii C146 55 km NE of Aus, Namibia: red dots and lines, grey body. Lithops schwantesii C150 (syn. kuibisensis) 25 km E of Aus, Namibia: stone grey body, red lines. Lithops schwantesii C164 25 km SW of Helmeringhausen, Namibia: grey brown mottled top. Lithops schwantesii C184 (syn. gulielmi) TL: 10 km NW of Helmeringhausen, Namibia: orange brown top, red lines. Lithops schwantesii C185 Near Helmeringhausen, Namibia: pinkish grey, red lines. Lithops schwantesii C190 70 km SW of Maltahöhe, Namibia: salmon red, faint pattern. Lithops schwantesii C191 60 km NW of Helmeringhausen, Namibia: soft pink stonelike top. Lithops schwantesii C211 10 km SE of Helmeringhausen, Namibia: puce pattern, stonelike. Lithops schwantesii C250 (grey Form) 120 km SE of Aus, Namibia: few red lines, dark grey body. Lithops schwantesii C265 45 km N of Helmeringhausen, Namibia: suffused with red-blue-grey. Lithops schwantesii subs. gebseri (de Boer) D.T.Cole: Windows absent, channels reduced to a network of grooves or furrows, largely taken up by rubrications, faces opaque to very obscurely translucent shades of brown or brownish grey. Lithops schwantesii subs. gebseri C165 TL: 70 km S of Maltahöhe, Namibia: brainy texture. Lithops schwantesii var. marthae C148 60 km SSE of Aus, Namibia: grey pink, smooth. Lithops schwantesii var. marthae C249 TL: 60 km SSE of Aus, Namibia: tiny bodies, gemlike. Lithops schwantesii var. marthae C299 120 km SSE of Aus, Namibia: pinkish grey, red lines. Lithops schwantesii var. marthae C411 75 km SE of Aus, Namibia: pale tops with subtle markings. Lithops schwantesii var. rugosa C192 60 km NW of Helmeringhausen, Namibia: indented pink grooves. Lithops schwantesii var. triebneri (L. Bolus) de Boer & Boom: Mustardy coloured tops. It is an heavy bloomer with yellow flowers in autumn. Lithops schwantesii var. urikosensis C074 (syn. christinae) 50 km W of Maltahöhe, Namibia: grey top, red lines. Lithops schwantesii var. urikosensis C075 (syn. nutupsdriftensis) TL: 35 km W of Maltahöhe, Namibia: Plant with very flat grey top and dark reddish lines. Lithops schwantesii var. urikosensis C083 Near Bethanien, Namibia: light grey, red lines. Lithops schwantesii var. urikosensis C105 TL: 100 km NW of Maltahöhe, Namibia: pink lines, grey body. Lithops schwantesii var. urikosensis C107 (syn. christinae) 20 km W of Maltahöhe, Namibia: grey green,red lines. Lithops schwantesii var. urikosensis C186 (syn. kunjasensis) 5 km NE of Helmeringhausen, Namibia: grey with red lines. Lithops schwantesii var. urikosensis C210 (syn. christinae) TL: 45 km W of Maltahöhe, Namibia: grey top, dark lines. Lithops schwantesii var. urikosensis C248 (syn. kunjasensis) 15 km NE of Helmeringhausen, Namibia: gemlike pink-grey.